Once a Month, on a Friday night we have a bar licence until 12 midnight, we serve food between 6pm and 9pm, and have some of the best live music in Oxted. 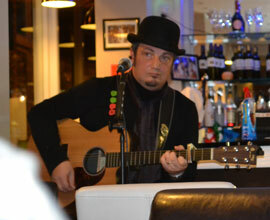 We have a special Friday Night Live Bistro Menu which is available whenever live music is being played. 27th of April, 7:30pm - Hammo Mat! Book a table now to avoid missing out. Frequent singers are Molly, Martin Mickels, Mat Hammond. Call us today on +44 (0)1883 717 031 to find out who is singing & when or to avoid disappointment by booking a table. Alternatively you can send us a message to make a booking. Mariam "Molly" Mickels first entered the world of music when she was given a violin for her fifth birthday. As a regular on the Medway folk scene she started playing with local musicians and performed at folk events such as the Rochester Sweeps Festival and later with the Royal Philharmonic Orchestra. Always leaning towards the rockier end of the scale she had a custom electro-acoustic violin made for her and began playing electric violin for local rock bands. At this point she discovered her voice doing backing vocals as well as violin in an all female rock band. Her passion turned to singing and her love for story telling and acting led her to study at the London School of Musical Theatre. Molly performed at the Edinburgh festival in 2006 in Michael Bruce's original musical "Hey Diddle Diddle". After this she became a regular on the London cabaret circuit where she was lucky enough to sing at the infamous "Madame Jo Jo's" and perform an original Cabaret as part of "Decadence Production Company". After meeting Martin Mickels in 2010 Mariam started performing on the Oxted music scene and later joined Idol Hands Music and Design LTD as a vocal/performance coach. In March 2014 she and Martin created Moonshine & Molly allowing Molly to combine her love of blues, rock and folk music with her passion for cabaret and the theatrical to create a unique entertainment experience. They now regularly perform together and released their debut album "Timeline" in December 2015 which is available to buy from the website. Molly also performs with musician Mat Hammond as "Manhattan & Molly" is one half of the vintage pinup duo The Whiskey Sours and performs many solo cabaret shows around the south east. 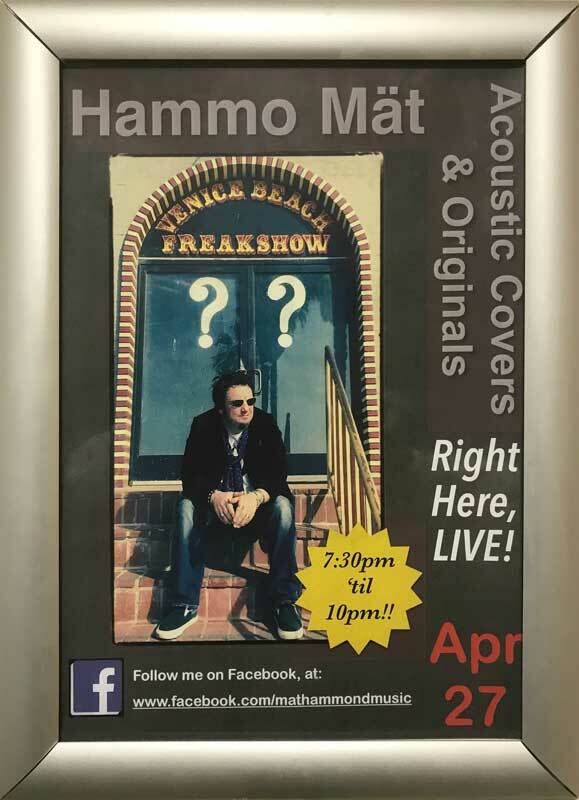 Mat Hammond is an accomplished musician, singer, songwriter and producer with a long and varied career behind him, and a promising future ahead. After years of begging and pleading with his parents, Mat finally got his first guitar at the age of 8 and began teaching himself to play by noodling around trying to match the notes with the songs he played on his record player. In his teens he formed his first band and switched to playing bass as his full time instrument. In his early 20s, Mat left the U.K. and moved to Hollywood, California (USA), to attend the esteemed Musicians Institute where he studied Bass, Vocals, Guitar, Songwriting and Music Business. Once Mat graduated, he worked as a professional musician, recording, touring and getting involved in a number of musical projects. Now, back in the UK, Mat Hammond is once again forging a musical path as a solo artist and performer. He also makes up one half of the acoustic duo "Double6" who you can listen to playing Blink 182's "All The Small Things" (left). 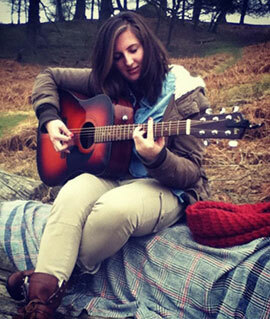 'Jovian' is an up and coming acoustic singer/songwriter from Sussex. He is currently working on recording his first album and many collaboration singles with other young breakthrough talents such as Woodzy and Jester from the London music scene. Visit Miles Jovian facebook page if you would like to learn more about him. Roger Blackman is a talented guitarist, singer, songwriter and session musician. He plays Melodic Hard Rock and writes his own songs. Never look Back (see left) is the follow up to début album "After The Storm" available online (itunes,amazon,spotify) of which a music video was filmed for the single "Crazy World". Roger also plays cover songs adding he own distinguishable flavour to popular and classic musical tracks (Angels, Heroes, Easy, My Way and more). 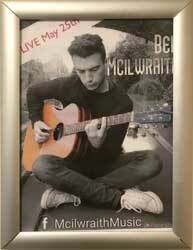 He has played guitar for Hatty Keane and has had tracks featured in the Bloodline Series and Lifeline CDs raising funds for worth while charities (Teenage Cancer Research). Visit his website for video tracks and cover songs. Sophie Mullan is from Surrey and moved near to Oxted in 2007. It was during this time she started to play the guitar and hasn't put it down since. Sophie has always enjoyed listening to chilled out, mellow, acoustic, folk style music and loves to sing it too with her favorite song being Alicia Keys, "If I Ain't Got You". She first sang this song with great success when she was only 10 years old with an aspiration to sing solo in her school show. After a very successful performance it has become her lucky charm that never fails to please audiences by allowing Sophie to show off her beautiful vocal range. She has played several venues, the biggest being a beer festival with approximately 700 people attending. Over the years she has broadened her vocal range, strengthened her voice and gained valuable experience by playing with various bands. Meg Jordan is from Kent. Meg has always had a passion for singing and songwriting which has led her to begin gigging over the last year, both singing and playing the guitar. A lot of her inspiration is from artists such as Eliza Doolittle, Adele and Tracey Chapman. In the near future she hopes to continue gigging and developing her songwriting talent with the goal of having a career in the entertainment industry. Visit our Facebook page to see customer comments, more photos or to "like" us.